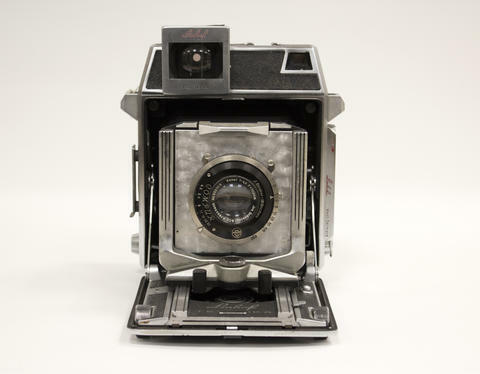 Item is a large format camera for 6 x 9 cm exposures on sheet or roll film. The Technika system used interchangable lenses mounted on boards. The back is extendible and is adjustable no all four corners to control for perspective. A plate for lens change range finder and calibration is mounted on the camera and the viewfinder has a special cover plate. No plate holder, or film holders are included, the lens is mounted on a non Linhof plate and is a substitute - a Schneider Xenar f4.5 105 mm with a Compur shutter 1-1/250. The item is in good condition. Bellows show repair attempt. Cleaned and lubricated. WARNING: When closing front cover, the lens must be fully retracted.Avoid force.